The DJM-900NXS2 takes mixing to another level with a first ever 64-bit mixing processor for a more natural, warm and detailed sound. The controls are even more responsive, with a new gain structure, improved EQ and fader curves. The Sound Colour FX section now has a parameter knob for even more nuanced manipulation. Plus an independent Send/Return means you no longer have to choose between Beat FX and external FX: you can connect your choice of external FX controllers, including apps on your iPad, and layer it on top of the on-board FX. Add to that four phono inputs, DVS support and two USB ports for easy connection to PC/Mac – and the DJM-900NXS2 is a crucial tool versatile enough for any professional booth. 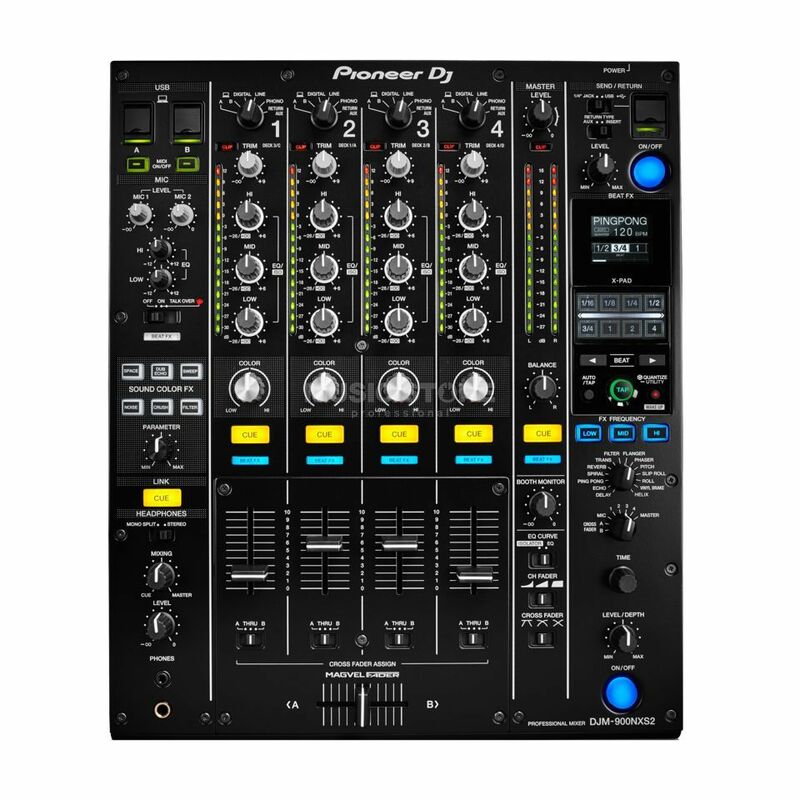 The Pioneer DJM-900NXS2 is a professional four-channel performance DJ mixer featuring a 64-bit processor. Now offering a more detailed sound, the second generation of this popular club mixer offers improved EQs, fader curves and a revised gain structure. Additionally, more control in the Sound Colour FX section, an independent send/return, a perfected beat FX range, FX Frequency, and multiple USB inputs also make this a superior version of the DJM-900. With this DJ mixer, you receive DVS support making it an extremely flexible mixing console, ideal for any professional use. The integrated 96kHz/64-bit processor includes sophisticated dithering technology and offers a clock with lower jitter. With a more natural and warmer analogue sound, this DJ mixer also comes with a Sound Colour FX section that provides six studio sound effects for each channel. Space, Dub Echo, Sweep, Noise, Crush and Filter can be directly selected via dedicated buttons and can be adjusted by means of a parameter knob. With FX Frequency, you can assign effects to three different frequency ranges (bass, mids, and treble). The independent send/return feature allows simultaneous use of internal and external effects. The aux input enables you to connect external sound sources as well as an iPhone/iPad via USB to use effects and instrument applications. The Pioneer DJM-900NXS2 DJ Mixer provides two USB ports for the simultaneous connection of two laptops including an A/B switch. This makes seamless DJ changes possible. It is including very useful features.